Thanks Eleanour, Ethinic Nationalsim is racism there are no two ways about it. Nearly every western country is etnically diverse, I cannot understand why our goverments are supporting a nationalistic ideology . Netenyahu is now throwing out the idea of creating an all jewish state in israel including what is still unresolved occuppied territory. which mean further potential diplacement. however politley put and with whatever faincle gains we are now supporting an ideology, in which we once fought against. First of all, the reason why Israelis want Israel to be a Jewish nation is the fact that Jews have gone through horror and persecution for hundreds of years and they wanted and needed their own little piece of land. That is why that land was given to them. The land given to them was mostly worthless desert land. Many of the so-called Palestinians did not even come from that area but from neighboring Muslim countries. Their purpose is to make sure that there is no country in the Middle East that is not run by Muslims. Since they have not been able to reach that point through war and terrorism, they would like to become the majority in Israel and win the country by vote and then Israel will be a Muslim nation. In addition it is interesting that in most (perhaps all) Muslim countries, non-Muslims don't have the same rights as Muslims and there is never anything said about this by the U.N. etc. The U.N. may be a "democracy" but there is no protection of the rights of the minority. The majority of the members are either Muslim countries or countries that side with the Muslims mostly because of the fact that Muslim countries have oil, etc. and Israel does not. Salaam- the UN conference on racism was an accurate acccount of who is guilty and who is racist-those who walked out-are guilty and racist...they could not bear the truth of their compicity in crimes-so they left-so as not to have to confront their own "demons". No bother, Brigitte. It is so good. I used to get the New Statesman delivered but somehow it stopped and I have never got around to taking out another subscription. There are excellent articles in it now and again. I agree, Tere! And yes hopefully one day there will be a peaceful solution. Yes, Brigitte - best ignored!!! Josh, For technical reasons Past Member? the truth is: "for ETHICAL reasons Past Member"! Thank you for the post...... How can "Past Member" continue to comment, there should be someway to keep the nonsense away. Thanks for the link, troll. I think we have solved the missing member mystery. The whole dialog carried forth by banned and nonbanned (along with Joshco the past member with tech issues) is horrifyingly racist and religious elitism to the core. Your a disgrace. Have the decency to post a profile or go ply your filth somewhere with people of like minds as yours. I see clearly why Care2 support did what they did and I could'nt agree more. The real question is why they allow you special privileges but I can promise you I'm going to find out. TAKE A good look at the eyes of the person in this photo.....I see T^^@##ST. what do you see? SusieQ, you are right about political correctness. If statistics shows that certain portion of the population is inclined to do specific acts, that group has to be watched better than the others. If this approach works in Sales and Marketing for hundreds of years, it must work at security as well. We can't and should not endanger our lives for political correctness. Josh (for tech reasons shown as Past Member). Your ringing endorsement of racial profiling. Lindsey, in practive I noticed Islamists getting together and flagging normal messages with opposing views. Moderators then jump in and delete messages and/or accounts. Islamists got a critical mass to make complaints look reasonable, while pro-Israeli supporters are less numbered, and complain less too. This trend is too obvious to miss. Do tell. Who are the Islamist conspirators? Isn't that the source of your "technical difficulties?" Not only is it imperative for moderate Muslims to denounce the "disease" of Islamism, it is even more important that they help eradicate the disease in any way possible. Before it takes control of their lives as well as the lives of the rest of us. The argument may be valid that the marginalization of a religious viewpoint is not racism per say. Just convenient? Spin it as you like. It still smells like BS. You routinely generalize about "Islamists" and refer to some of my friends, others and I as supporters, ergo;we are terrorists. Even the owners of Care2! Your "common sense" perpetuates RACISM. Don't take my reference to racial profiling out of context. I was very specific where I applied it. Given your examples, common sense would dictate the same treatment of radical Zionist terrorists and their apologists such as yourself. It really is nothing short of fascinating to watch your fanatical conspiracy allegations of using techniques that have been historically exclusive and documented by Care2 members and others, as tried and true suppression tools successfully utilized at youtube and other forums by prozionist zealots. Who's the conspiracy theorist now? Locan-you are a dear! and very patient! Hi Aisha :) Thank you for your kind words and support. They mean a lot to me! You are right, Past Member knows nothing about me and tries to make me look like a horrible person with a sinister agenda. But I'm just an everyday woman with a family that I love so much and is my priority. I've been very lucky and blessed in my life so when I see other women, children and families suffer so much in other places I just can't look the other way. I try to help in everyway I can, which is a tiny drop in the ocean but I believe in unity and solidarity. You are right to ignore "Past Member" as much as you can, and you're also right that it is an illness. No one in their right mind would spend so much energy disrupting conversations. While it is ok to disagree and have different opinion, it's not ok to disrupt every topic just for the sake of it, with nothing constructive to offer, but only rehashing the same rambling arguments which are AGAINST the Spirit of Care2 and strewn with petty attacks against real members. If the United States is dead-wrong, I'm going to say so! I'm going to call you on it, and you can take that to the bank. I, for one, have absolutely had it with you. Past Member said: "Aisha, Brigitte is a professional and knows her stuff and techniques to "refuse to acknowledge violations of human rights: misinformation, baiting, deceit, selective memory, fake compassion, intimidation, misplacing/shifting the blame, sending activists on guilt trips, posting personal attacks, lies, threats, and so on. " as she wrote on these pages. Thanks for helping -again- show what you are! Actually in your comments here you've used most of these techniques. Now if you say one more time that it's a description of me, you'll confirm yourself as a troll once again! I still have a lot to learn but you're so obvious that even a child could tell you're not real and your intentions are not good. "Well, Aisha, you decide if you want to follow Brigitte's advice and believe all the myths about "flourishing country called Palestine", "
I never said anyone should believe myths, neither did I mention "a florishing country called Palestine". You put words in my mouth, just because you don't know what else to say! How pathetic! And unethical. What I said to Aisha is that you are hardly a reputable source, having been REPEATEDLY BANNED by Care2. If you have to keep "commenting", the least you can do is learn how to read. Whoever is behind all your banned profiles, I wonder if you realize what a fool you are making of yourself? In the meanwhile, the article is excellent and no one should miss it. Racism is a worldwide issue, it's extremely serious. The focus should stay there ONLY (despite past members pitiful attempts at distracting from it). Who are "the Islamists"? (This is NOT a rhetorical question.) If they are not just a (huge) figment of your imagination, why don't you name them? I'm sorry to say this but you're a bit thick in the skull if you don't understand that it is not because of your opinions that you've been banned (your friends with the same opinions as you ARE regular members) but because of your attitude (trolling) which is welcome on NO normal forum, yahoo group or the internet in general. So if you want to blame someone, blame yourself. Enough with your pity parties. With your accusations you continually disrespect the Care2 moderators, then you wonder why you've stayed banned. If you don't like their site, why don't you find another place to haunt? There's a reason why Care2 has options such as flagging inappropriate comments or phony profiles. Well at least you're getting back on topic. Better late than never. Let's see if you are not just pretending, and how long it will be before your next attack and/or name-calling. Please post historical information and facts from truly reputable sources. Here's your chance. Well said, Tim, Locan, Brigitte, Aisha! I am ignoring this person. I cannot stand inflated egos! And there is no coherent argument ever - it's all pro-Israel no matter what they do, no matter what they have done. So what's the point in responding? You could write the script! The main thing is if people read the article. Can he not understand he is not going to influence people? They have minds of their own and they can read articles and make up those minds all by themselves. You would have to be pretty stuck to rely on this one for guidance on anything. Wish he would save his breath to cool his porridge though but he is so tiresome I don't even read his contributions any more. Good article, Eleanor, thank you. May 01, 2009 "Palestine Chronicle" -- - Racism is common to most and probably all societies. Laws never seem entirely to eliminate it. It was the essential tool in the creation of modern settler states. The United States could not have come into existence without the obliteration of North American Indian cultures and of large numbers of the people themselves. They had to die so the US could be born. In Australia the indigenous people of Tasmania were wiped out to the last man, woman and child, while on the mainland the tribes were massacred, confined, stripped of their ancestral land and eventually turned into fringe dwellers. Until recently Australia had a prime minister who could deny that aboriginal children of mixed �blood� were taken from their parents up to the 1930s and refused to issue any expression of remorse for their mistreatment. More recent targets of racism have been Lebanese and Vietnamese immigrants, while the Howard federal government�s racist treatment of Iraqi and Afghan refugees and asylum seekers remains one of the most shameful chapters of Australia�s history. Racism comes in many shades. Discrimination against people on the grounds of skin color, ethnicity or religion is a basic human rights issue, a first cousin to discrimination, harassment and denial of opportunity on the basis of gender. President Mahmud Ahmedinejad, in his recent speech at the Durban Review Conference in Geneva, drew attention to Israel as a racist state but Iran has serious issues of its own to deal with. Homosexuality in Iran is treated as a crime. Gays and prostitutes are executed in public. The Bahais have been the victims of discrimination and persecution throughout Iran�s modern history and this remains the case today. They have no legal identity in Iran. On all of these issues, Iran is itself vulnerable to criticism on the grounds of human rights, which does not, of course, detract in any way from his criticism of Israel. The outrage directed against Ahmedinajad obscured the real issue at the heart of what he was saying: is Israel a racist state? In settler societies such as the United States, Australia and Canada, the crude racism which drove invasion and colonization mostly belongs to the past, when there was an active concept of race, allied with the categories of civilization, barbarism and savagery. The North American Indian was regarded by the white settlers as a savage, perhaps noble, mean or cunning, but a savage �redskin� nevertheless. In Australia the indigenous people were scarcely counted as human beings. It was not until the 1960s that they were even given the vote. The same relegation of �Negroes� to a contingent category of humanity (at best) justified slavery and segregation in the southern states of the United States. The dehumanization of all of these groups was essential to the colonizing process (including the colonization of Algeria after the French invasion of 1830) and the enrichment of white settlers. All modern �western� colonial settler states share the same characteristics, i.e. the obliteration of indigenous cultures and the displacement of people from their land. This was true of the North American settlers, the Australian colonists and the Boers who eliminated the Herero people of southwest Africa in the early 20th century. Treaties in which the indigenous people were compelled to consent to the invasion and settlement of their land were signed in North America and New Zealand but not in Australia, where the colonists regarded the indigenous people as less than human and could therefore assert that the land was �empty�. There are numerous parallels here with Zionism not only on the basis of an �empty� land being settled or of civilization being brought to a �primitive� people but in the double nature of the colonialism. In North America and Palestine, settlement was fostered by a distant government against which the settlers eventually rebelled before declaring their �independence�. Gradually, mostly only in the last half century, laws and attitudes changed. This rolling process met with resistance at every stage from those who justified discrimination on the basis of the Bible or racist genetic theories. Not until the 1960s and 1970s were racially discriminatory laws eliminated from the statute books in modern settler states such as the US and Australia, which does not mean that structural racism has been eliminated. It has not. It can be measured in education, health and welfare statistics, while episodes of racism involving police and the public at large show that attitudes are harder to change than laws. The difference between Israel and these other settler states is partly one of timing. Israel was founded not at the beginning or the middle of the historical cycle of the settler state phenomenon but right at the end. Israel is a paradox � a settler state arising at the beginning of the post-colonial era. Across Africa, southeast Asia, Latin America and the Middle East, national liberation movements challenged powers unwilling to voluntarily relinquish the territories they had seized in the 19th century. The right of native people to self-determination was expressed in the UN Charter. It was at this precise moment that Israel was established. At a time when universal values were being emphasized Israel headed in the opposite direction. The Holocaust generated enormous emotional support across the western world for the establishment of Israel. It might not have been the �pretext� for its creation of Israel, as Mahmud Ahmedinejad is reported to have said in Geneva, but it was certainly exploited by the Zionists to make sure that Israel came into existence. Refugees from Europe might have gone elsewhere, but for ideological reasons the only place the Zionist movement wanted them to go was Palestine. The media joined the chorus calling for the creation of a Jewish state in Palestine as a solution to the refugee problem and an antidote to anti-semitism. In fact removing the victims from the scene of the crime was no answer to the historical problem of European anti-semitism. Their �solution� allowed European governments to evade responsibility for the consequences of actions in which all of them were in some way complicit. A people who were in no way responsible for the massive crimes which had been committed against Jews were being made to pay for them. Their rights and interests were treated with as much indifference or disdain as anti-semites had traditionally treated the rights and interests of Jews. The export of the �Jewish problem� to Palestine was in its own way anti-semitic. Within the British government there were objections but only for financial reasons. Britain was broke and could not afford the extra cost of policing Palestine were 100,000 Jewish refugees from Europe to be admitted as the Zionists and President Truman were demanding in 1946. Even within the US administrations there were reservations. 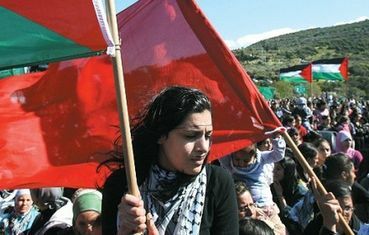 How, for example, could the principle of self-determination be reconciled with the denial of the right of the majority of the people of Palestine to decide their own future? Would not a �socialist� Jewish state in Palestine further the ambitions of the USSR in the Middle East? And what of America�s interests and its relations with the Arab world? They could only be seriously damaged by support for this project. Ultimately it was Truman and not the UN who decided that Israel would be created in Palestine. Without his direct intervention the partition vote would never have got across the finishing line at the UN General Assembly. It still has to remembered that the vote was only a recommendation, anyway, swept aside when Ben-Gurion, ignoring the provisions of the partition plan, made a unilateral declaration of �independence� in the name of the state of Israel six months after the plan was passed. In essence it was no different from the declaration of UDI made in the 1960s by the Rhodesian Prime Minister, Ian Smith. In the name of �independence�, both Smith and David Ben-Gurion declared war on the right of an indigenous people to determine their own future on their own land. One got away with it and one did not. What kind of state Israel would become was predetermined. In Israel today there are individuals and organizations fighting for coexistence with the Palestinians but since the beginning of Zionist settlement such voices have always spoken from the margins. From Herzl�s time onward it was understand within the mainstream that the Palestinians would never give up their land voluntarily and somehow would have to be removed from it. Thus Israel deliberately set itself from the beginning not just against the Palestinians but against the entire population of the Middle East, for whom Palestine (with Jerusalem at its heart) was an inalienable part of the Arab-Islamic heritage. Zionist justification rested on the argument that the �Jewish people� were the true indigenous people of Palestine and that Muslims and Christians were present only as �caretakers� whose role in history had now come to an end. The secondary moral position was that the suffering of Jews throughout history added up to a stronger claim than the rights of the Palestinians, a line of reasoning supported by Arthur James Balfour in 1917. The end justified the means. If it took the deprivation of Palestinian rights for a Jewish state to come into existence, so be it. In a land in which the vast bulk of the population was not Jewish, a Jewish state could only be constructed by taking one inherently racist measure after another. If the state were to be Jewish so would land ownership and labor. The conditions written into the charter of the Jewish National Fund and other land-purchasing organizations stipulated that land once acquired could never be retained to non-Jewish hands. This �extra-territorialisation� of land as it was described by a British commission of inquiry sent to Palestine fuelled the Palestinian rebellion of 1936-39. Exclusive Jewish access to the land was followed through after 1948 by the destruction of approximately 500 villages and the passage of �absent property� and �present absentee� laws which prevented even Palestinians remaining inside Israel from returning to the property they owned. Security laws were another means of separating the Palestinians from their land. Consolidation of the Jewish presence on the land has continued through the attempt to erase the Palestinian presence in Jaffa and other cities inside the �green line�. On the other side of the green line the tactics are cruder and more obvious. Open demographic war is being waged against the Palestinians in East Jerusalem while in Hebron the centre of the city has been closed down and residents around the market moved out in the name of �security�, i.e. the protection of racist and fanatical Jewish settlers living in the heights above. Across the occupied West Bank it is the armed interlopers who describe the Palestinians as interlopers and �infiltrators� of their own occupied land. All of their vandalism, bullying, harassment of men, women and children, destruction of property and uprooting of olive trees and occasional killing is underwritten by the state, and yet the state is outraged when the charge of racism is raised in Geneva. The colonization of the territories is not incidental or accidental racism but the carefully thought out strategic and ideological racism of a racist state. The fact that it continues every single day is testimony to Israel�s contempt for universal values and international law. Just as the land would have to be the exclusive possession of the Jewish �people� (as 93 per cent of it is now legally classified), so it could only be worked by Jewish labor. Jewish employers were explicitly prohibited from hiring �Arab� workers in the 1920s and 1930s. Until the 1960s the central Israeli labor organization, the Histadrut, would only admit Jewish members. In practice, labor discrimination has never worked perfectly because of the low cost of �Arab� labor compared to �Jewish� labor and because of the Palestinian need to work, a situation which has led to Palestinian laborers building the settlements being constructed on their own occupied land. When the Israeli Prime Minister Golda Meir visited Gaza in the 1970s she expressed shock, not at the establishment of Jewish settlements on expropriated land, but at the use of �Arab� labor to work the land for the settlers. As Israel was the state for Jews wherever they lived and not for all the people who lived within its borders (so to speak, seeing that Israel has never actually declared its borders), the laws would have to be framed accordingly. The Nationality Law automatically conferred Israeli citizenship only on Jews (i.e born of a Jewish mother). The Law of Return granted the �right� of �return� to Jews who had never lived in Palestine while denying the right of return to Palestinians who had lived there for generations. Some families could trace their origins in Palestine back to the Islamic conquest of the 7th century. The structural discrimination against the Palestinians can be measured in socio-economic statistics dealing with poverty, unemployment, access to government services and education, house construction and funding for municipalities. Taking their cue from the government, and the openly racist statements made by senior political, military and religious figures, describing the Palestinians as �two legged animals�, �drugged cockroaches�, �insects�, �snakes� and �a cancer�, large numbers of Israelis polled have said they do not want to live in the same apartment blocks as �Arabs� and in fact would like to see them out of the state altogether. The racism coming out of the mouths of rabbis and religious seminaries, couched in terms of an exclusive Jewish right to �Eretz Israel�, with many of the students or graduates of these seminaries living in the most aggressive of the West Bank settlements, is amongst the worst. Having set out on this path Israel has followed it unswervingly. One flagrant violation of human rights must be followed by another. Without war and without racism in spirit, deed and law there can be no Zionism and no �Jewish state�. The Palestinians have been pursued wherever they have gone because by their presence they constitute an existential threat to Israel. Over the years the attitudes of the Israeli mainstream towards the Palestinian �enemy� have grown even harsher. Palestinian armed struggle, suicide bombings and the rocketing of settlements near Gaza are not connected with the policies pursued by Israel against the Palestinians for six decades but with some ex nihilio desire to kill Jews and destroy Israel. This state of mind is deliberately cultivated from the top with the aim of keeping Israel�s Jewish citizens in a state of permanent readiness for the next war. The recent �war� in Gaza was approved by more than 80 per cent of Israel�s Jewish population. The misrepresentation of a massive military onslaught on a largely defenseless civilian population as a �war� allowed the civilian mainstream to justify the crimes that were being committed. Israelis looked on with indifference and even with approval as �our boys� killed hundreds of people in three weeks, most of them civilians and 400 of them children. The media turned into a kingdom of lies. Every specious argument of the political and military establishment was accepted without question and transformed into truth. The racist t-shirts printed by Israeli �soldiers� engaged in the attack on Gaza were only the surface manifestation of a much deeper psychosis. The t-shirts captured the attention of the outside world in a way that slow, structural, incremental racism never does. Literally every day brings some new or continuing manifestation of Israeli state racism to the surface. After 50 years the beduin are still being driven off their traditional land in the Naqab. Palestinians married to Israelis are prevented from living inside Israel with their spouses and families. The recently declared Jerusalem Regional Master Plan is inherently racist but apparently too complex for the outside media to work out its implications. It embodies the next stage of programmed discrimination that has continued without letup since 1967. The Jerusalem municipality is itself an illegal and racist body whose �master plan� is a template for the further �Judaisation� of Jerusalem whatever the cost to the Palestinians. It must be remembered that until 1948 Palestinian Muslims and Christians owned about 70 per cent of the property in West Jerusalem and all but one or two per cent of the property in the east. They did not forfeit their rights to their houses and land. Their rights have simply been usurped. In normal legal parlance the appropriation of their property is known as theft. For the first time since the Crusaders massacred Jews and Muslims in the 11th century Jerusalem is being transformed into a city for a people of only one religious denomination. Under Arab and Ottoman rule Jerusalem remained a polyglot city. What the Jerusalem municipality and the state of Israel both want is a city cleansed of its non-Jewish population except for tourists and a colorful ethnic remnant hanging around the old city. Israelis involved in the struggle against racism and occupation are fighting an uphill battle. The structural discrimination of the state against its non-Jewish citizens and against the Palestinians living in the occupied territories (as well as the Syrians living on the occupied Golan Heights) is a motor driving Israel and its people from one extreme to another. Thirty years ago it was regarded as unthinkable that Menahim Begin could ever be Israel�s Prime Minister but Begin was followed by Yitzhak Shamir, Benyamin Netanyahu and Ehud Olmert. All of them come out of the same school of Revisionist Zionism. Now revisionism is the mainstream, the labor movement is marginalized and Israel has again elected Netanyahu as its Prime Minister. He in turn has chosen as Foreign Minister the crude, arrogant, provocative and openly racist West Bank settler Avigdor Liebermann. Racism in Israel is not like racism in other states, which is usually a matter of changing laws and slowly working on public opinion. In Israel racism is so deeply embedded in Zionist ideology and the structure of the state that without racism Israel cannot remain the state that it has become. Yet there are no signs that the Israeli people or the politicians they are electing as their leaders have any intention of changing direction. When they have a powerful military and when they are under no pressure from the outside world they see no reason to change. In its blockade of Gaza Israel has been supported from the beginning by the US, the EU and the Quartet. None of these venerable authorities could see any reason for Israel to be punished or restrained even after the killing of 1400 Palestinians in Gaza from late December 2008 to mid-January 2009. Their indulgence encourages a dangerous state of mind. The politicians, the generals, the rabbis, the media commentators and the academics know that they are in the right and that everyone else is in the wrong. The outrage at criticism, the arrogance, the self-righteousness, the self-justification, the endless claims of moral superiority and the contempt and hatred of the Palestinians are extremely disturbing. Israel is not a small, weak state in the middle of nowhere. It is a powerful state, armed with nuclear weapons, in the middle of the Middle East. The refusal of the �international community� to restrain states which live outside the law has led to many disasters in the past. The species of animal life known as homo sapiens has a poor record when it comes to averting calamities ahead of time. In the Middle East the creation of Israel brought disaster down on the heads of the Palestinians and the surrounding Arab countries. The states which created Israel have not yet taken responsibility for the consequences of their actions, but have rather made themselves more complicit in the crimes still being committed. As long as the disaster is someone else�s (and not Israel�s) they do not seem to be concerned. How else can this be understood but as their own racism? Do they have to be pushed to the point where they are directly and unavoidably involved in Israel�s confrontation with the Palestinians and the surrounding Arab world to realize the consequences of what they have done these past six decades? - Jeremy Salt is associate professor in Middle Eastern History and Politics at Bilkent University in Ankara, Turkey. Previously, he taught at Bosporus University in Istanbul and the University of Melbourne in the Departments of Middle Eastern Studies and Political Science. Professor Salt has written many articles on Middle East issues, particularly Palestine, and was a journalist for The Age newspaper when he lived in Melbourne. Poor Josh, lol! I just don't think he has the brain cells to understand and no one can morally condemn someone with such a disability! I agree, if you have to hide who you really are, you have serious issues that probably require professional help! Islamic revolution, that's one of the dumbest things I have ever heard! I can't speak for anyone else but I personally don't know one single person of the Islam faith in real life. However two of my best friend are Jewish and I like several online Jewish friends! However I certainly would not have any problem with being friends with anyone of the Islam faith as I'm not so shallow as to judge people by their color, religion, sexuality or any other reason other than whom they are! Therefore, Josh, your reasoning has just been blown away, lol! Why care2 continues to let you post as a past memeber is beyond me! But I hear for a price you can buy an IP from a lot of countries? And Josh, I have seldom see anyone that silences their opponents as well as the IDF/Mossad! The lies and propaganda that the IDF spews forth is at least equal to the Nazis of the World War 11 era! And I really detest Nazis, old or new, gentile or semitic! "You cannot currently send a star to Brigitte because you have done so within the last week." You cannot currently send a star to Brigitte because you have done so within the last week. So ditto A'isha! Love to you and all here who have minds open enough to recognise the truth. Let it be on the conscience of those who deny it and who are content to see the Palestinian people suffer for the sins of others. Might will never be right. And the mighty always fall - the zionists will fall as the nazis did. The German people are ashamed of the nazis and what they did to the Jewish people. Decent Israelis are just as ashamed of the zionists. The world should listen to their voices and stop supporting oppression and genocide. Interesting you are talking morality: you refused to condemn an Arab who killed 13yo Jewish boy with an axe when we discussed the article. You switched topic, insulted me personally and stood away. You refused to condemn cold-blooded murder of a child. Don't give me your BS of who you are and whom you know. You are too smart not to hear about "export of Islamic revolution" by Iranians, don't pretend to be stupid and ignorant. You know very well, as much everyone reading news from Iran, what I am talking about, don't consider others for idiots and bunch of suckers. I do have Muslim friends for years, they were at my house, they tell me their disgust of what's going on. Nice honest clever people, from Iran and Pakistan I am talking about. We have our arguments, but some things we share - and our attitude for crazy maniac Ahmedinejad is one of them. You are the one spewing lies and propaganda of Goebells quality, starting with repeating case of Muhammed Dura killed by Arabs and blamed on Jews. You try to describe Israeli Army as terrorists, while in reality they save lives and go unbelievably steps to ptotect innocent Arabs from harm. Besides, why do you brought Arab allies Nazis into discussion, you may offend them by criticizing the Nazis. I will return your question: Why care2 continues to let you post is beyond me! You and other guys forced Care2 to silence me and other pro-American and pro-Israeli writers a number of times, by deleting accounts and messaged. You showed you can pull moderators as you wish and made them look foolish at best. Josh (yes, same old Josh). Writers that don't deal with the truth make themselves look foolish. As we have all seen, everything Josh (or whatever it's name is today) accuses the "islamists" of doing, we know he has done already. So do tell us about your imaginary friends. Thanks for the flame-bait Josh. You cannot currently send a star to Brigitte because you have done so within the last week. Locan, you keep twisting out from the topic of the discussion. I will tell you that my Muslims friends are not imaginery, they are well educated and are making very decent living. As I said, smart and intelligent people, from Pakistan and Iran. They like the last Iranian Shah. They, as I said, don't like the idea to export Iranian Islamic revolution - which Islamists, like you, support, even though this idea is crazy and will lead to much of blood - it already did. What about all the myths about "flourishing country called Palestine", which never existed in the real world? And what about the real history, the history of Jews in Palestine, and their real state Israel in Palestine (the ancient one, with the King Solomon Temple standing in Jerusalem and Jesus walking around) and see for yourself if Jews have to be denied all that. Will you ever have courage to answer the questions? I do not support anyone who killed a 13 year old jewish boy with an axe! I don't support any murderers anywhere! I probably did not flag the article, not because I am not interested in futher conversations but because I have way too much email to track everything! I am certainly not giving any BS as to whom I am and whom I know. I am exactly who I say and live exactly where I say. I haven't got anything to hide and I certainly don't pretend to be someone I am not!!! You have surprised me however by telling me you have had Muslim friends! You got a little respect from me. Sorry but I have never seen anything regarding Muhammed Al Dura that proves he was killed by Arabs and not the IDF. Never. Except from Israel and you can hardly expect me to believe Israeli propaganda. My personal opinion, which I have always said, is that the IDF killed him and that was after hours and hours of research. Ok, Josh, if someone told you that there was a place where it was all fenced in with guards, that one tribe was starving and denying medical supplies to the other tribe. That that same tribe denying medical supplies was also shutting off electricity so that sewer was ankle deep or higher in that other tribe's area. Let's call the tribe controlling food, medical supplies, etc., tribe A and the one being denied tribe B. Now forget you know who we are talking about. Let's also say tribe A has extremely advanced weapons and has a ton of money thanks to the U.S. Whould it not look to you like Tribe A was nazi-like? Not to mention tribe A talks about "cleansing," plows tribe B's houses down for the land etc. IF you did not know who we were talking about, what would you think about Tribe A?? By the way I am 100% American and love my country so I have no idea why you would think I would try to silence pro American or pro israeli writers for that matter?! Actually I have flagged you once as a past member to be honest. And I have no idea what you are saying about Iran. There is NO proof that they have weapons of nuclear type and that is according to the UN inspectors. It's no secret that the IDF want to bomb Iran even without proof that they have nuclear weapons. You are assuming things about Iran that you do not know! I don't know that's for sure! Do I absolutely trust that they will not make nuclear weapons? NO. I don't know period! But bombing people just because you don't like them and they don't like you, is a very dangerous and stupid way to operate! Josh, maybe you don't understand the difference between an intelligent conversation and down right harassment? You harass so many people that you have to expect to be harassed back! What goes around comes around. You blame people for flagging you when you constantly attack any article that does not show the IDF in a positive light??? You call them Hamas supporters, anti-american, etc because they see the IDF for what they really are??? What's up with that?! In conclusion; Humans are not smart enough to live in world peace unfortunately! Yes, because of that we all need armies. Yes, I know the IDF could be for the defense of Israeli Jews IF all they did was defend instead of abuse the Palestinians like they certainly seem to love to do! It's not my fault there is so much hatred in that area! I pray daily for all wars to stop, for all humans, animals and the Earth! I've not lied about anything Josh! I don't need to. Read the article, Past Member. (Emphasis on MEMBER) The Topic is Racism. Friends like the Shah? Did they make their money exploiting their countrymen also? Find an article that supports your claims, fill out a profile (if Care2 will let you,) and post the article. We'll chat. Word to the wise, eat your Weaties. Marty, you surprized me this time as well. Good answer, we can surely talk. On your picture, did tribe B (opressed in your scheme) vowed to take over all land given to tribe A (the opressors) and kill them later? Did tribe B rejected a number of peace offers from tribe A? Did tribe A does not discriminate about tribe B who happen to live in areas of tribe A? Does tribe B got modern weapons to fight A? Does tribe B teach its children hate of anything A-related since childhood? Does A levels houses of its own when they steal the land? What is the ratio of killed B in comparison to total population? What was the ratio of victims killed by Nazi to the total number of victims available to Nazis? Do these ratios match, or even close, to deserve the comparison? I was discussing Iran with Locan, it wasn't about bombing Iran, it was about ahmedinejad's idea of forceful export of Islamic revolution to the world. He seems to support it, and I asked him why? "And, so long as you remain so full of steaming piles of manure.." - why such language in my posts. Nobody flagged him so far, if we speak of what is or isn't fair. IDF is an Army. Compare it with other Armies at war. Prove the number of innocent victims is higher than by others. - I will accept your point as truth. 1. When Israeli Army refuses to bomb populated areas because of dangers to civilian population and sends solders on foot - unprecedented campaign with increased losses of its own solders - and gets blamed later for "massacres in Jenin" which was a complete lie by Arafat recognized later by everybody else - and up to now gets blamed first and investigated later - that's not fair. 2. Do you know that approximately 200 Chechens were killed to 1 Palestinian in comparison, and about 20% of all Chechens were killed at the war. How can an intelligent man call IDF terrorist, unless he wants to put pressure on IDF to make it demoralized and uncapable to defend Jews in Israel? They don't "love to abuse" palestinians - don't believe such nonsense. Bad apples - yes, but Army puts them in jail! Which other Armies besides US do it? Thanks Eleanor! I enjoyed the article and agree with it. I just wish the USA would pay its bill to the UN! Yes you have some really good points there. I never said Hamas was innocent as I do not support them either. I think what bothers me most is the mind frame over there. And I don't mean on just one side, it's both. There is good and bad to all things. Yes, tribe B was guilty of some of those things. However I just don't see that either side really wants peace. Ok, back to the real picture. I don't see what the ratio killed per total population has to do with anything. It's the amount of people killed per attack that I think is important. For instance on this last 22 day war, 13 Jews were killed and almost 1500 Palestinians. Now if it was only Hamas that was killed I could understand it more but all those kids and non-hamas people is really shameful! See I don't believe the IDF are that bad with weapons since they are one of the best trained military outfits in the world. Meaning I don't think the cared about all the civilian casualties. Using illegal phosphorus weapons and DIME weapons which are of a nuclear nature. You know I can provide articles to back this up but I don't think you need them. No if we compare numbers, the Nazis killed between 6 to 7 million Jews and lots of other folks too and of couse the IDF has not come close to that yet but I was never comparing total deaths. No, not everything is the IDF's fault, never said it was. I am not exactly clear on Jenin. It's one of those stories with conflicting views again. I would have had to been there and watched to see who was telling the truth. I do not believe most of what the IDF says anymore than I would believe what Hamas said. No I did not know that about Chechens, thanks. I will leave you with some videos to ponder. Please do not turn them into the IDF internet gestapo, lol! Was this soldier that shot the Palestinian in the foot arrested? How about usinig Palestinians as shields? That's enough for now Josh but I think you can start to see the picture. Copy and paste the video links as they are not active on these posts. Care2 staff: You know who past member is and I have a clue who this individual is. You have his IP, why do you let him have here so many trolls?? The bigger question may be, Will the Democratic smear machine be successful in linking a geriatric far right wing imbecile to the Republican party enough to force legislation that most Americans disprove of?